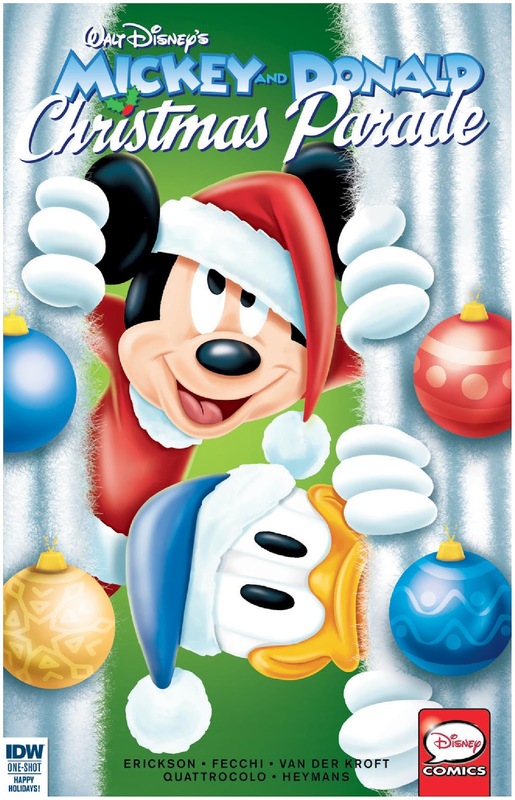 The Fellowship was fortunate enough to obtain a copy of MICKEY AND DONALD CHRISTMAS PARADE #2 from IDW Publishing. The stories are by Byron Erickson, Giampaolo Soldati, Otto Veenhoven, Evert Geradts, and Carlotta Quattrocolo. The art is by Massimo Fecchi, Disney Italia with Deron Bennett, Robert van der Kroft, Mau Heymans, Peter Collé, and Carlo Limido. The colors are by Digikore Studios, Stuart Chaifetz, Digikore Studios (with David Gerstein), Sanoma (with David Gerstein), and Disney Italia (with Deron Bennett). Lettering is by Travis and Nicole Seitler, and Deron Bennett. Translation and dialogue by Maura McManus and Deron Bennett. Mickey Mouse has taken a trip in a time machine built by Doc Static. Upon returning, he discovers that the timeline has changed and Christmas is no longer celebrated. With the assistance of Donald Duck, his nephews, Scrooge McDuck, and Gyro Gearloose, Mickey must go back to 1956 and discover what happened and fix the timeline. Will our heroes be successful? Who is responsible for this nightmare and for what reason? The issue also includes backup tales starring The Big Bad Wolf, Uncle Scrooge and Donald Duck. This was a great little adventure to read and can be enjoyed by kids of all ages. These stories are appearing in the U.S. for the first time (originally published in Holland, Sweden, and Italy). The translations were well done; everything was understandable (not an easy thing to do sometimes). Very colorful art and fun stories that helps one get into the spirit of the season. Check it out. MICKEY AND DONALD CHRISTMAS PARADE #2 is in stores now or available at www.idwpublishing.com.